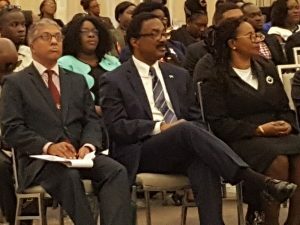 Guyana’s plans to establish a law school have hit a major snag with the Caribbean Council of Legal Education (CLE) saying its treaty does not provide for countries or private entities to build and operate law schools, a hurdle Attorney General Basil Williams said was raised for the first time at this weekend’s Council meeting. CLE Chairman, Armour told reporters after the CLE meeting referred to Article 1 (3) (b) Treaty of the Council of Legal Education, saying it makes its “quite clear” that the regional body is to “establish, maintain and equip its law schools”, a provision that does not cater for other parties. “The concept of other persons forming a law school and bringing them to the Council for approval doesn’t fit within the Treaty and that is one of the points that we have made to the Attorney General that his government needs to reconsider in terms of the proposal that has been brought to us so far,” he said when asked whether the joint venture arrangement is generally accepted by the CLE.